The researchers have applied a mathematical model to a real world situation, the environmental collapse of a lake in China, to help prove a theory which suggests an ecosystem ‘flickers’, or fluctuates dramatically between healthy and unhealthy states, shortly before its eventual collapse. 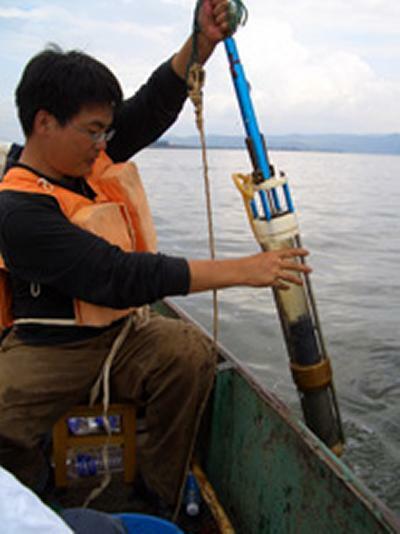 A team led by Dr Rong Wang extracted core samples from sediment at the bottom of Lake Erhai in Yunnan province, China and charted the levels and variation of fossilised algae (diatoms) over a 125-year period. Analysis of the core sample data showed the algae communities remained relatively stable up until about 30 years before the lake’s collapse into a turbid or polluted state. However, the core samples for these last three decades showed much fluctuation, indicating there had been numerous dramatic changes in the types and concentrations of algae present in the water – evidence of the ‘flickering’ before the lake’s final definitive change of state. Rong Wang comments: “By using the algae as a measure of the lake’s health, we have shown that its eco-system ‘wobbled’ before making a critical transition – in this instance, to a turbid state. The researchers hope the method they have trialled in China could be applied to other regions and landscapes. The paper, ‘Flickering gives early warning signals of a critical transition to a eutrophic lake state’ is published in the journal Nature. For a copy, please contact Peter Franklin at the University of Southampton: p.franklin@soton.ac.uk.